The Netherlands has gained a large facility: the FELIX facility at Radboud University Nijmegen. FELIX has four free-electron lasers (FELs) . The facility provides intense far-infrared radiation over the entire wavelength range from 3 to 1500 micrometres (in other words a frequency range of 200 gigahertz to 100 terahertz). Within the FELIX facility researchers can perform measurements and carry out experiments with this intense far-infrared radiation in advanced experimental set-ups. A unique link has been made with magnets within the High Field Magnet Laboratory (HFML). The standalone FELIX facility and the combined facility with HFML , create unique new research possibilities for physicists, chemists, material researchers, astrophysicists and biomolecular scientists. 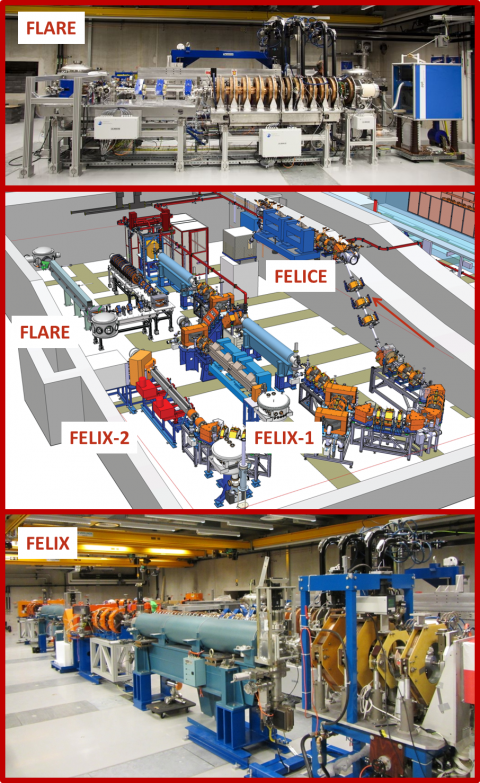 FELIX is the outcome of a merger between the free-electron laser facility based on a single free-electron laser, FLARE (operational in Nijmegen since 2011), and three light sources relocated from FOM institute DIFFER. Not only the lasers, but also the personnel from both organisations have been merged. The facility in Nijmegen has restarted operations since the second half of 2013. The free electron laser FLARE, which creates light with long wavelengths, and FEL-2, which covers the shorter wavelength part of the spectrum, are operational and have been used since the last quarter of 2013 in user experiments. Researchers have obtained the first experimental results in the area of structure determinations of metal-organic ions, spectrums of water on neutral metal clusters, and the first pump-probe experiments on phosphorus doping of silicon crystals. The first magneto-optical experiments have also been performed. The strength of the light from FLARE makes it possible to perform not just spectroscopy but also to realise the non-linear response in the form of saturation effects. The researchers expect the results to appear shortly in the first original publications. In 2014 a further two instruments will become operational: the FEL-1, which covers the wavelength between FEL-2 and FLARE, and FELICE, the spectacular free-electron laser that permits experiments in optical cavities, where light intensities are maximal. Impression of the FELIX facility with photos from the FLARE laser, which has been in use since September 2011, and the construction of the free-electron lasers which have been relocated from FOM institute DIFFER.